Lisa Gal is the founder of Hollywood Swag Bag, a unique boutique style gifting company located in Los Angeles. 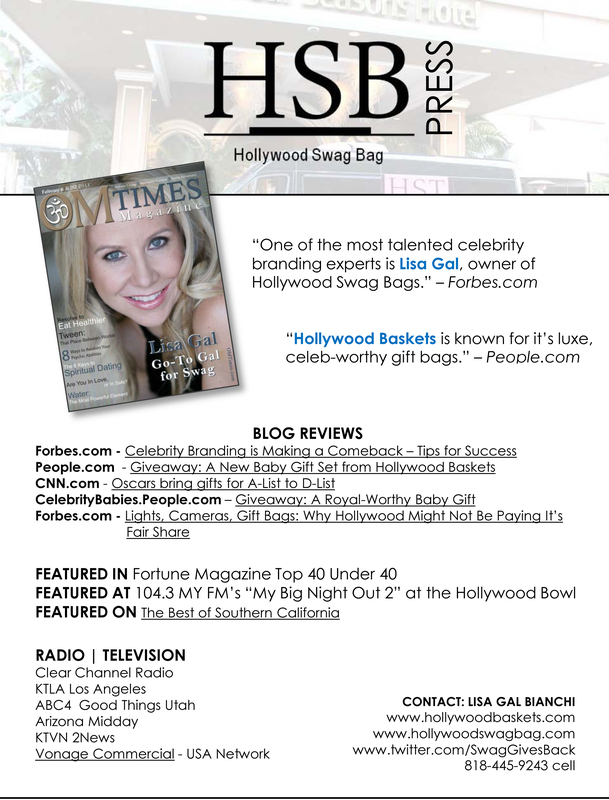 Hollywood Swag Bag differs from gifting companies that host gifting suites. Hollywood Swag Bag works with our clients in a PR Manner and extends their products to celebrities in a more personal environment. Our gifting take place in Young Hollywood Studios in Beverly Hills, in gift bags at the Four Seasons Hotel at Beverly Hills, also in individual targeting gifting that includes personal contact with the celebrity clients. including baby gifting for new celebrity mothers in Hollywood. Our gifts go direct to the celebrity. Our caliber of celebrity is A-list, which sets us apart from the other gifting companies in Los Angeles. We also market our companies to various media outlets. Most gifting includes paid press releases, media spotlight (radio, print or television), and many times celebrity photos. We were featured on Extra! with Mario Lopez for My Big Night Out for the Hollywood Bowl backstage! Our gifts have been featured with CNN, KTLA, Clear Channel Radio and much more.